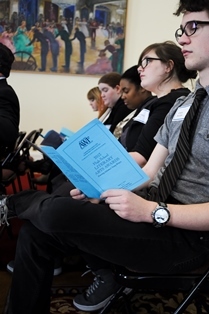 The Alabama High School Literary Arts Awards and Scholarship Competition (HSLAA) ceremony will be held on Wednesday, March 12, 11 a.m.-1 p.m. in the Alabama State Capitol in Montgomery. Celebrating its 19th anniversary, the annual HSLAA is one of the Alabama Writers’ Forum’s flagship programs. Since 1995, the Forum has awarded over $80,000 in prizes to young writers. Open to all Alabama students enrolled in grades 9-12, the competition recognizes outstanding creative writing students in the state’s public, private, and home schools. The Forum offers cash awards and certificates of recognition to top students in the poetry, short fiction, drama, and creative nonfiction categories. Nationally recognized Alabama writers judge the field of entries. In addition, the Forum awards scholarships to high school seniors for outstanding literary portfolios. These portfolios include 20-50 pages of work from at least two genres. Privately funded by generous donors, each scholarship carries a cash prize. The competition also recognizes outstanding literary magazines. Categories include literary content, graphic design and layout, and overall literary content and graphic design. Magazines are judged on quality of writing, layout and design, and illustration by a panel of editors.